Hello Julio César Detrinidad Bermúdez! Unfortunately we are unable to reproduce the issue. We do not have ideas why this error can occur on your machine either. Hello, Here is the info, if you need more don't hesitate to ask. Here is the procedure I followed. 2. Selected the following options in the wizard: Windows environment, XPO, Authentication None, No modules selected. Regarding the error that you reported, I can say that our development team decided it and the solution will be added to the new version of the Xafari. Thanks for the support. Do you have an estimated date for the next release? Usually a new release is published after the release of the new version of devexpress. Thanks! Let's wait and I'll try with the next release. Hello! Do you have an estimated date for the next release (17.2.5)? We today published a new build of Xafari 17.2.5011.1402. Keyword not supported: 'xpodatastorepool'. ---> System.ArgumentException: Keyword not supported: 'xpodatastorepool'. I assume that I will have lot of troubles adding Xafari Framework to an existing project. I added with success everything on the project created with your template but I have an advanced project and will be difficult to adapt in short time. 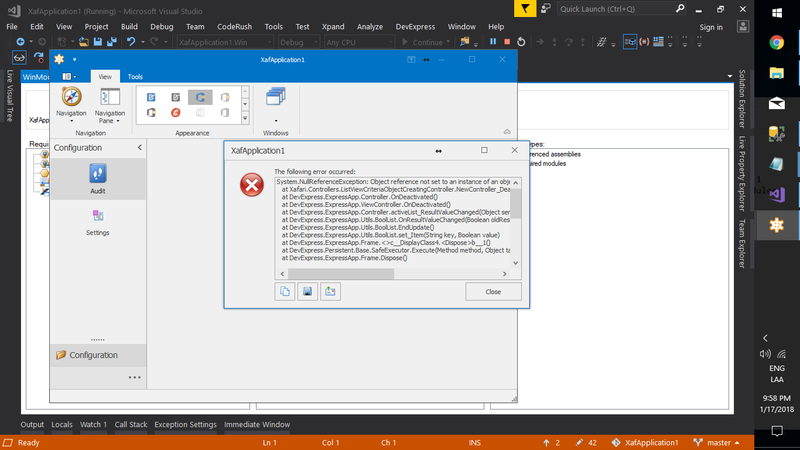 Do you test your modules on templates created with Devexpress default gallery? Or should I adapt my project with some changes to make it run successfully? 1.Open the WinApplication module in your project. Regarding the second error that you reported I can say that all information submitted to our development team. Also a relevant issue [102.179136] registered in our issue tracking system. You may reference to this number later to find out its state. We don't test own modules on templates created with Devexpress default gallery. But we think that if you adapt your project, it will be successfully executed.